The Common Shelduck is a beautiful sharp-coloured duck, which is common in the coastal region, especially on the islands of the Wadden Sea. 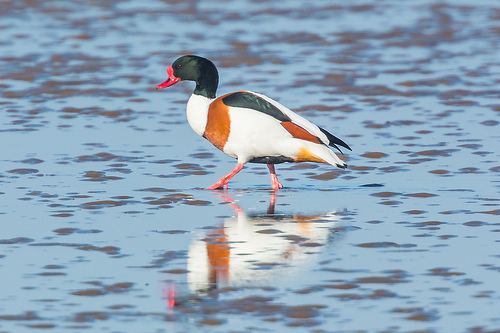 The Shelduck has a preference to breed in abandoned rabbit holes. Once the young are large enough, the Shelduck family walks to the open water. 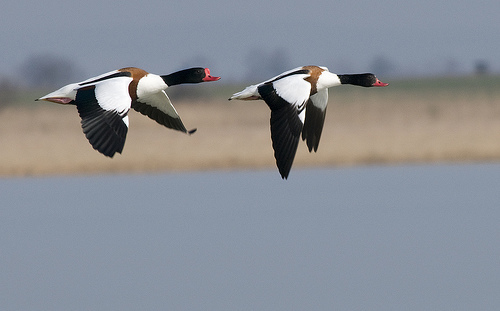 In late summer the Shelducks flock together in the German Wadden Sea in great numbers during the moulting period. With the combination of white, brown, and green the Shoveler and the Shelduck have some resemblance. The Shoveler has a very large beak. The Shelduck has a normal-sized, bright-red beak.